The Ariens lawn mower company has roots dating to 1897, when Henry and Christine Ariens started a small foundry in their garage. By 1933, Ariens was manufacturing roto-tillers, and in the 1950’s the first riding lawn mower was produced. It continues producing qualiy lawn and garden products to this day. 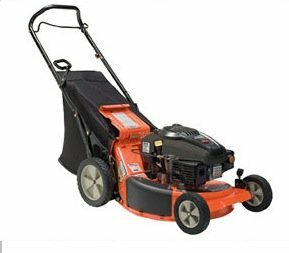 Ariens mowers are considered to be ‘high end’ quality mowers, for those consumers looking to buy a commercial grade machine. Ariens mowers offers no less than nine different walk behind models. All are equipped with a heavy duty steel deck with a baked on finish. No cast aluminum decks are available. All the engines used are the overhead valve design, which helps provide more mowing power, and increase fuel economy. Choose between the Kohler or Kawasaki OHV design. Models available fall into either the Pro, Blade Runner, or Classic categories. Ariens offers one mower in the Pro series. The Pro 21 SP comes equipped with a Kawasaki OHV engine, and a variable speed self propel system. A blade brake is standard. The Blade Runner has various options, including either push or variable speed self propel. A Kohler OHV engine provides 7 ft-lbs of net torque, making this a powerful mower. The top of the line model also sports an electric start. The Classic Series offers 5 models to choose from. The least expensive version is a push mower. If self propel version is desired, the speed is adjustable up to 4 MPH. Both the Kawasaki OHV and the Kohler OHV engines are available, depending on the model. Because Ariens has so many different brands to choose from, there is a handy model comparison chart available on the manufacture’s website. Most customers that purchase a Ariens mower buy another in the future, based on high satisfaction.